A few months ago, a woman in my neighborhood was replacing all of the windows in her home. 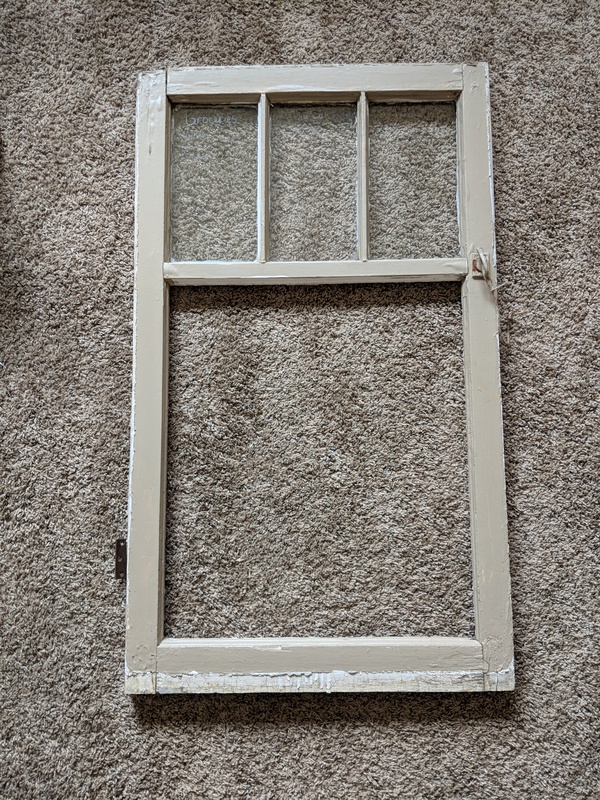 She posted the old windows for free on facebook and I snatched up as many as I could as quickly as I could! These beauties were original to the house built in the 1920’s and have so much character. I have a whole stack and a long list of projects to do with them! This one was one of a kind, tall with one large pane in the bottom and three small panes in the top. The plan was to hang it and use it as a dry erase board but sadly it blew over in the wind as I had it set outside waiting for a wash. 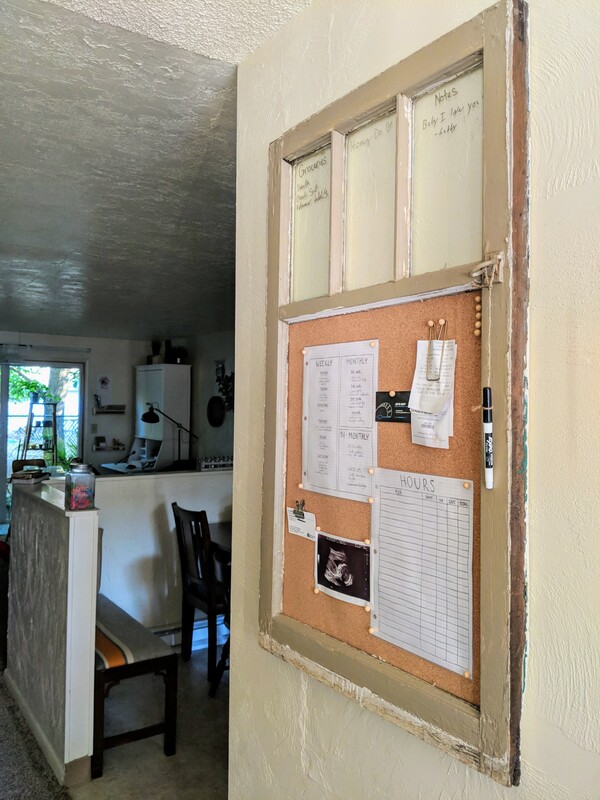 The large pane shattered but look now – the perfect space for a cork board! 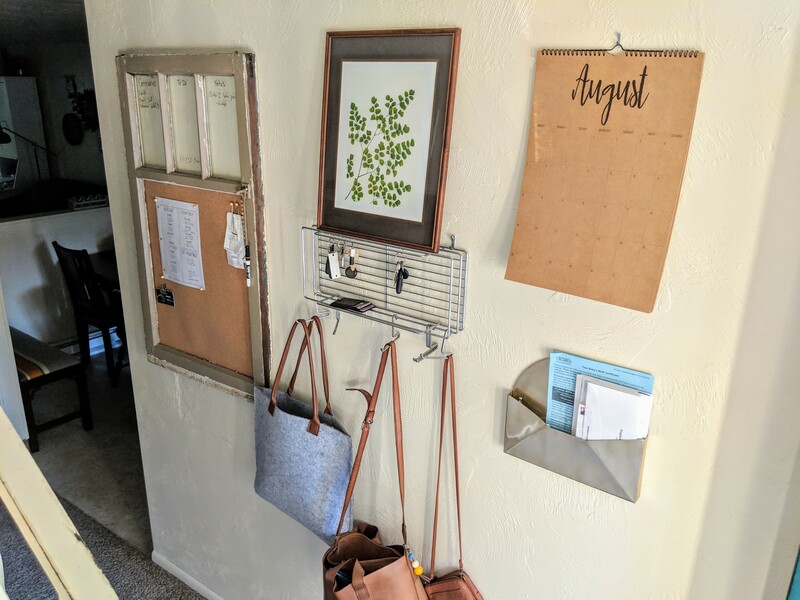 The three top panes will still be used as dry erase boards and are perfectly separated for three separate lists (in my case, our grocery list, honey-do’s, and notes) and the large cork board space on the bottom will be perfect for pinning coupons, reminders, pictures, and notes. 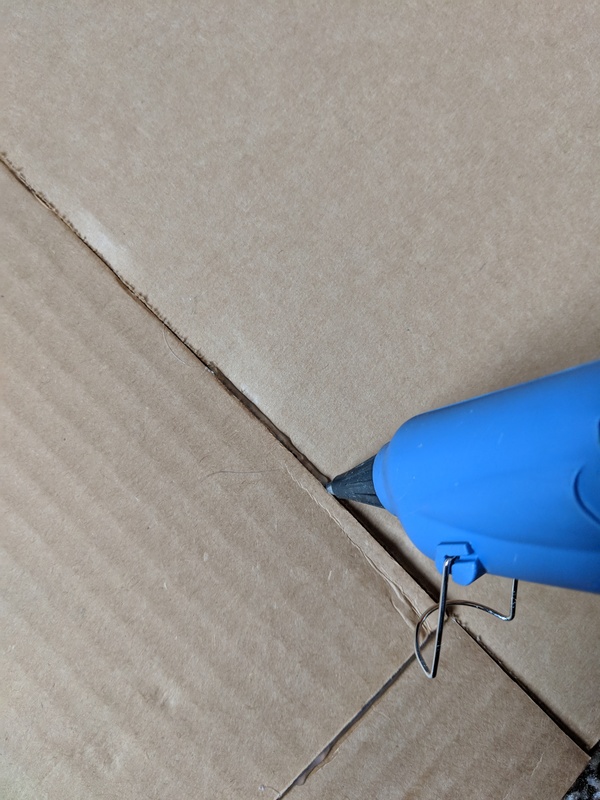 This will be an easy and straightforward DIY but I’ll show you exactly what I’m doing so that you can easily follow along! 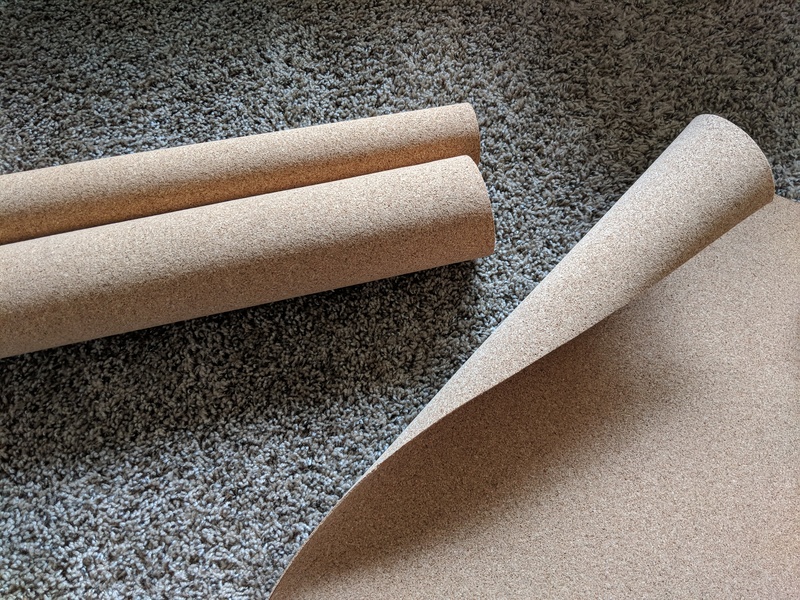 First things first, I purchased this roll of cork off of Amazon and this set of picture hanging hardware from Target (I used the bumpy piece at the top of the image). Then, I prepped the window by cleaning it and removing any broken glass and bonding from the large pane space. 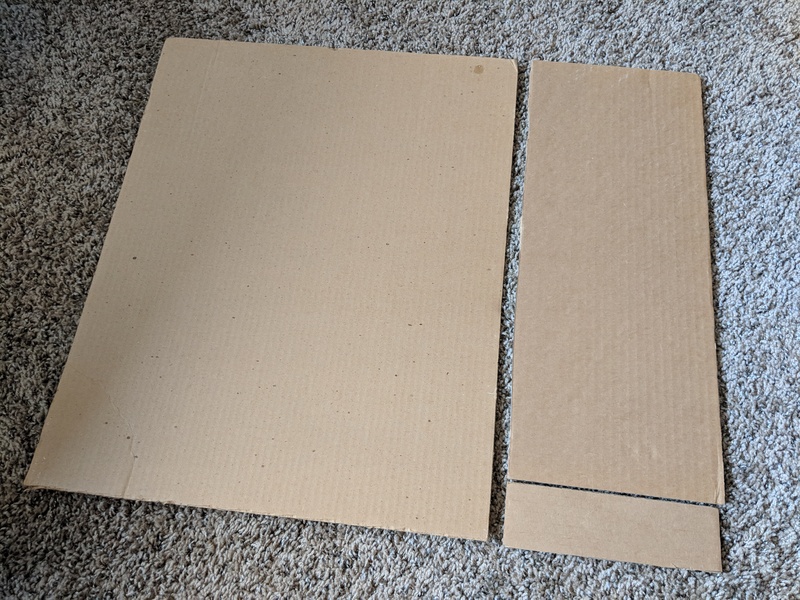 Next, I measured the open space and cut cardboard into the same dimensions. I didn’t have one piece that was big enough for the space, so I had to cut a few pieces to fit when placed together. Then, I cut my cork into the same dimensions. The roll of cork that I bought is not very thick so I cut two pieces to layer together for more thickness. 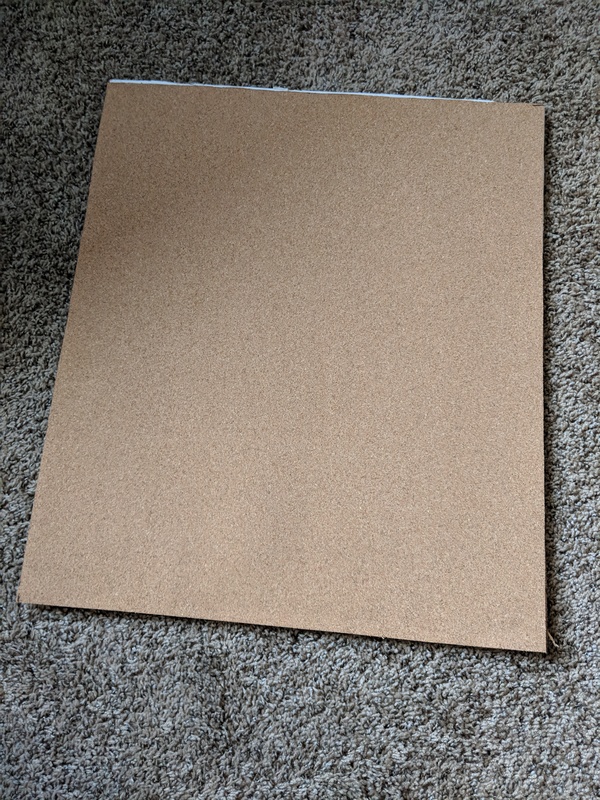 Laying out my cardboard, I carefully lined up and hot glued one piece of cork on top. Once the cardboard was glued to the cork, I glued the second layer of cork on top. With my cork now stabilized, I placed it inside my window as you would a picture into a picture frame. 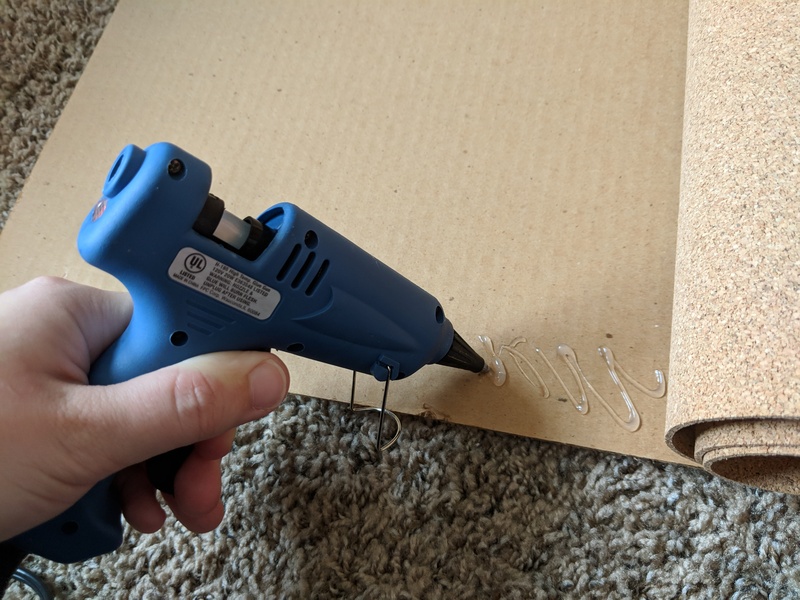 From here, you can either hammer nails into the sides of the window to keep the cork in place, or I’m sure you can find and install the little metal tabs that come in store-bought frames – but I just used my trusty old hot glue gun. 🙂 It was already hot and ready after all! On the front of my window, there is a little latch handle that I was planning on removing. 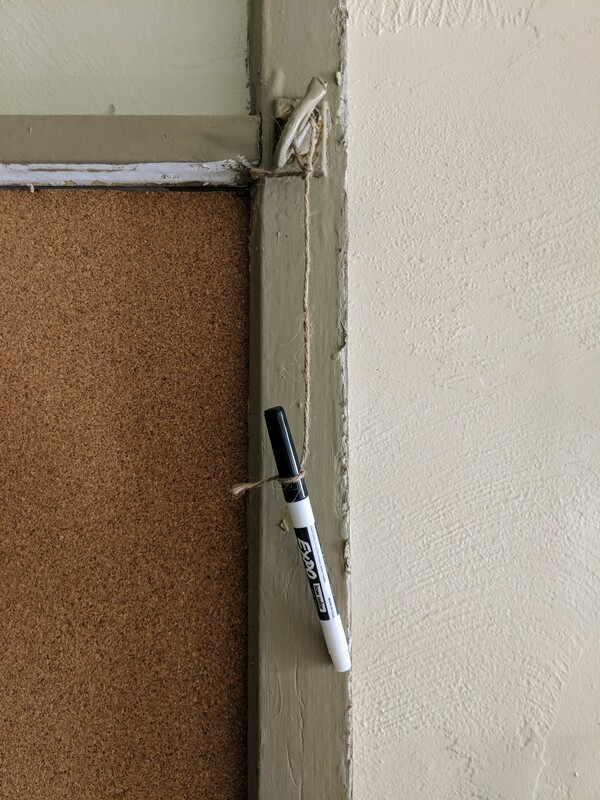 However, it turned out to be a much bigger endeavor than I had anticipated so instead I tied some twine to the latch handle and the other end to a dry erase marker. Now my marker is at the ready for all my charting and list making needs! The last thing I did was install the hardware for hanging. 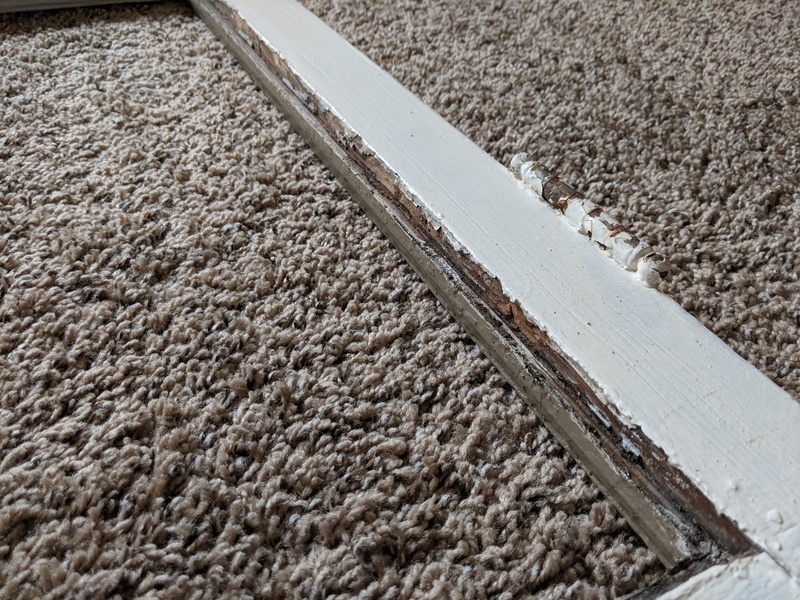 This will vary depending on what hardware you buy but mine was simple – just two small nails driven through the holes in the hardware and into the wood. Because the window is large and somewhat heavy, I installed two pieces of hardware, one on either side. And now all that’s left to do is hang it! 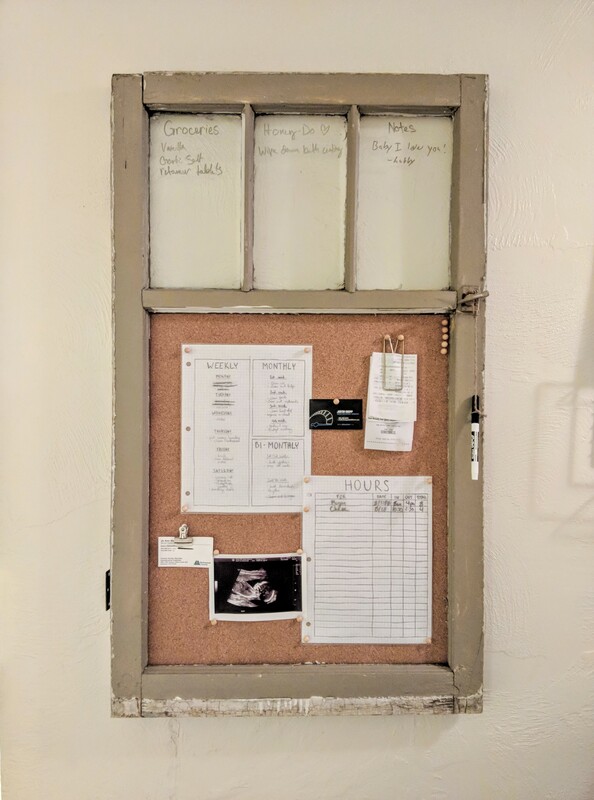 I have a wall right inside my front door that serves as sort of a command center with a calendar, a mailbox, a place to set our wallets and keys, and now this beauty. 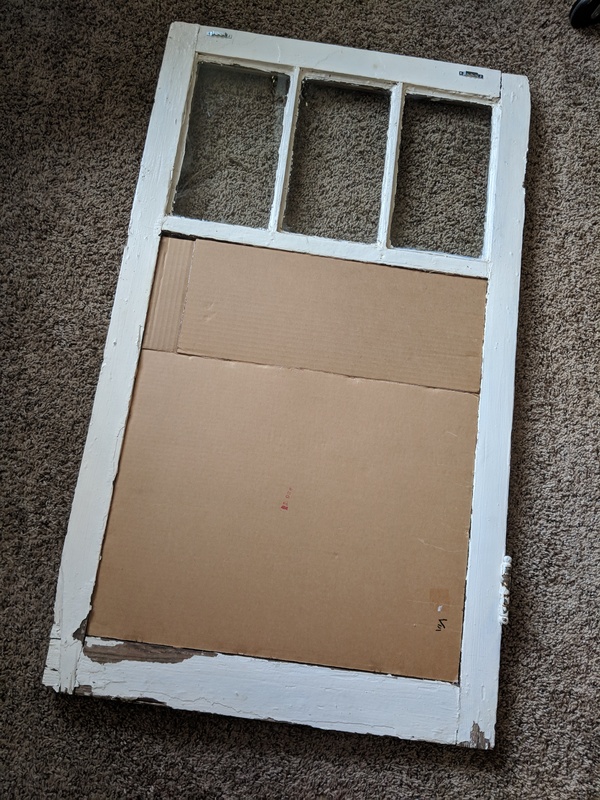 Got any old windows laying around? Comment down below to let me know whether you’ll be trying this out! You can also use the hashtag #createdmakersDIY to show us your finished product!